It went more slowly than I would have liked. This was mostly because I had to clean a path to the sewing machine and neaten up my space a bit. This is problem numero uno with having your craft room in a corner of the playroom. I managed to finish a dress I had started a month or so ago for Oona (pics later) and I started on a simple throw quilt for the couch in a christmas-y pattern that matches my tablecloth (who doesn’t love a nice red and white toile for christmas?). All that it is composed of is two lengths of coordinating fabric with some wool batting sandwiched between and some top – stitching. No piecing to do, no applique. I am using an old “Favorite Things” pattern called “French Bedroom“. Which brings me to my second problem with Sewing Sunday. I always seem to have “help”. Especially when working on a cozy wool – filled blanket. He makes himself comfortable right where I need him NOT to be. As “helpful” as all this is, it is still an improvement over his “help” earlier in the day. You see, I started off Sewing Sunday with him knocking a full glass of water into my lap as I sat at my desk getting my sewing supplies in order. 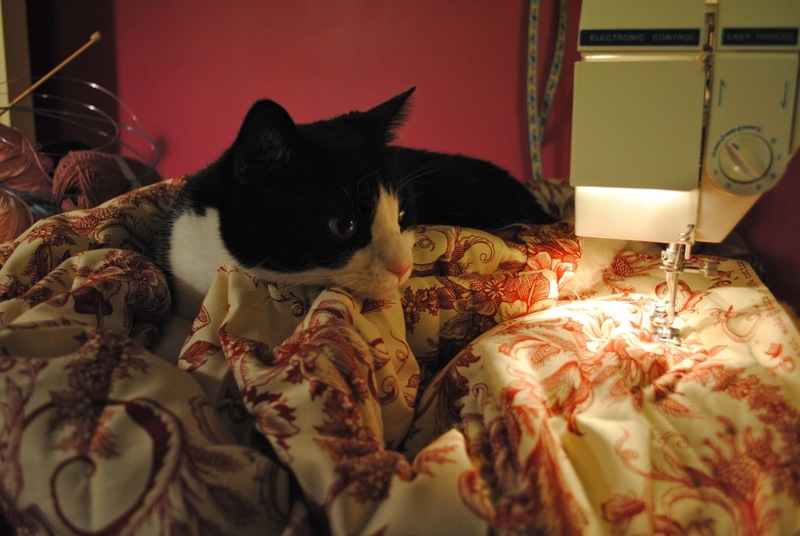 Anyway I got a fair amount of work done on the quilt before retiring to bed, where the cat promptly deposited himself on my face for the night. 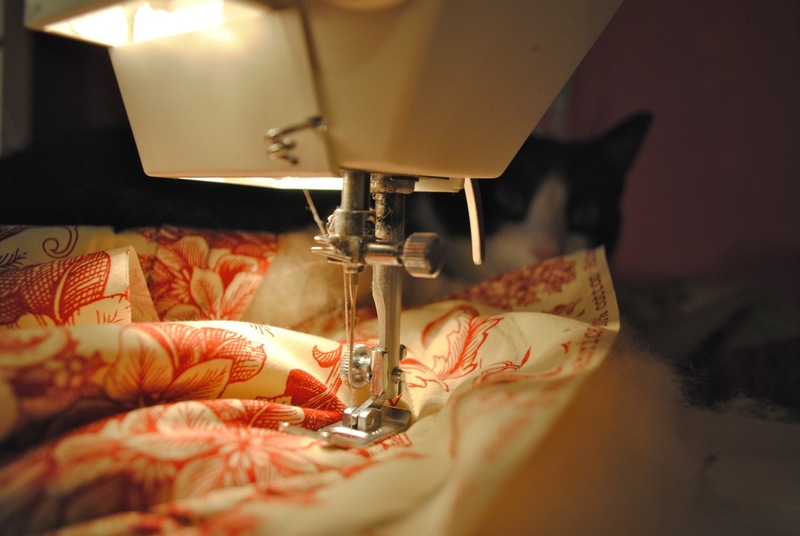 This entry was posted in Uncategorized and tagged Pets, Sewing. Bookmark the permalink. Aaaaaw, at least he’s a cute helper! That looks like it is going to be a lovely throw when it’s finished. My cats leave me alone when I an sewing, but one of my cats loves to do fly-bys to grab my yarn and run away with it when I am knitting. What a gorgeous throw! I live your “helper”, too. Mine usually end up between me & my knitting so I can’t see a thing. That, or our youngest bats at/takes off with the working yarn. The should say I lOve your helper…fat fingers today.